The King of Kings, originally uploaded by joshuaellingson. When I was a kid, sometimes I'd sneak into my grandparents' room and snoop around. Their house was full of unusual antiques, figurines, books, and other treasures. On one of my explorations I found a pack of nudie cards in my grandpa's dresser. Years later I told my mother about finding the pack of cards and it turns out that she used to sneak in there and look at them too. Now I own Grandpa's "Good Luck" card set and it always reminds me of home. 1)I generally start with a sketch on paper. For this one I used some Col-Erase Pencils. I like them because each color has it's own hardness of lead. Also, if I start with one color, I can tighten up a drawing with another color and see where I've been. 2)I scan the sketch or take a photo of it and put it into Adobe Illustrator on it's own layer. In the layers properties, I choose "Dim Images to 50%" for the layer with the sketch. I usually lock this layer, create a new layer on top, and start tracing with the pen tool. 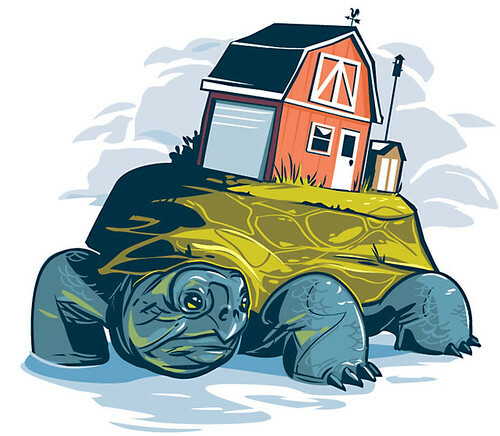 4) Behind the line art, on it's own layer, I create areas of flat color. I also knew that for this one I didn't want many black lines, so I made all the lines a color with the intention of changing them later. 5 and 6) At this point it's really about "painting" in the details and highlights on various layers, It's important to keep your layers organized. 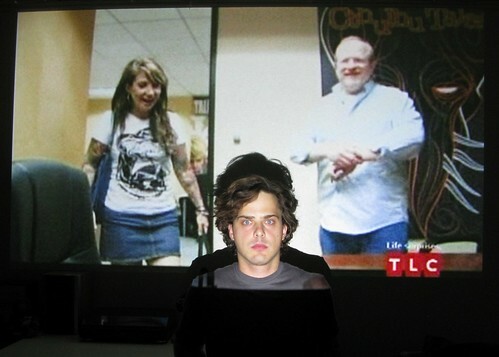 Merge and label. Oh, and save often. I often sell prints of my work at comic conventions and boutique art stores. In case you haven't heard, many of my prints are now available for sale on my website. Back by popular demand, my web store offers 18 different images for purchase via any major credit card. The prints are priced at $40 plus shipping and local tax. Each print shipped signed by the artist (that's me!). These images are printed using an Epson R1800 Wide Format Photographic Inkjet Printer on 11.7"x16.5" (A3) Epson Ultra Premium Matte Paper. The inks are Epson UltraChrome inks and are promised to resist fading by the fine folks at Epson. These prints are "open-editions" and shipped signed by the artist. The prints are shipped rolled in a tube via USPS Priority Mail with Delivery Confirmation unless requested otherwise. USPS Priority rates apply. $1.65 handling is added for delivery confirmation. Please allow 3 to 6 weeks for delivery although I'll try my best to get your orders out to you as soon as possible. 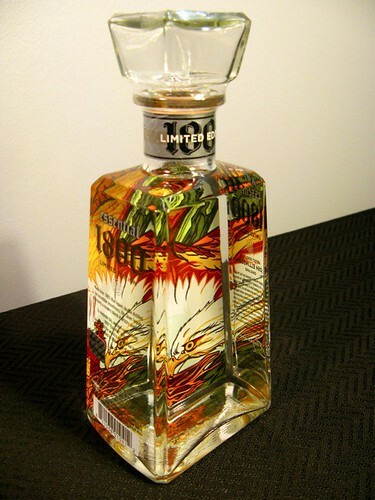 1800 Tequila Bottle 7, originally uploaded by joshuaellingson. 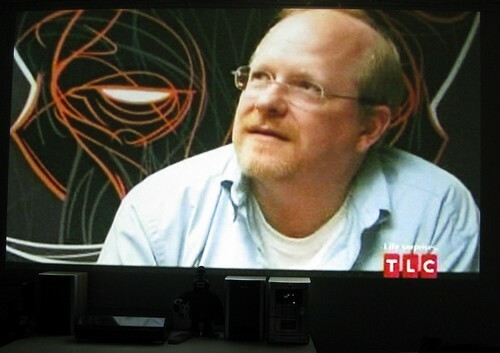 My art was featured as part of 1800 Tequila's "Essential Artists" campaign. Part of the campaign was limited edition bottles with the artists' work. Here's mine! Thank you to all of the fine folks who made it out for APE, despite the weather-hangover-electionjitters-economy-etc. You are all gold. It all went by so fast. The only thing I ended up buying was All-Star Superman at the Isotope party on Saturday. I'm sure I would have spent all my money on the floor if I had left my table. Just about everyone I talked with was impressed with the level of quality stuff at APE this year. So many talented people were representing their artwork. It's scary and completely invigorating. Thanks for raising the bar, jerks! More of Scott's great photos from this year's APE are here. For the past six years, I've been creating artwork for the talented performer, Suzanne Ramsey aka "Kitten on the Keys". Suzanne is a great friend and one of the best clients I've ever had. Photo by Mi Mi LeMeauxAs "Kitten on the Keys" she has set the bar as the go-to Emcee for burlesque/caberet events. By hosting and performing in such productions as the Miss Exotic World Pagent, Tease-O-Rama, and Caberet New Burlesque, Kitten has brought her twisted brand of sweet and savory vittles to the hungry all over the globe. It's always a pleasure to work with her on promotions for shows, cd artwork, fund raisers, merchandise, or whatever materials she needs. The images above are some of the merchandise imagery that I put together for Kitten on the Keys after our first meeeting. I was really into 60's style spot illustration and the work of Al Hirschfeld. You can see my humble attempt to imitate those styles a little. These spot illustrations are still used on Kitten on the Keys tshirts, buttons, and other items. Both Suzanne and I were interested in vintage Japanese character design and I used that inspiration for a postcard design. The Kanji on the card reads "Happy Kitty Girl". A couple of years later, I was hired to create the artwork for Kitten on the Key's first major release, "(It's Not A) Pretty Princess Day". We decided to expand on the style and color of the postcard for the CD materials. In 2006, Bender's Bar in San Francisco held a benefit for Suzanne's dental bills. They asked me to do the postcard and it was a lot of fun. In 2007, Suzanne me asked me to create new black and white artwork for her "Salty Meat Girl" CD and merchandise. In addition, we made an activity/coloring book that included recipes, a maze, a recipe for lamb marinade, and a fold out poster. I'm starting to add "Case Studies" to the Artwork section of my website. These entries will describe some of the artwork and processes on particular project. 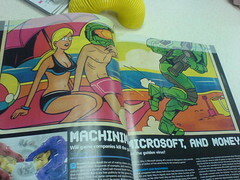 Below is the first Case Study, about my relationship with Games for Windows Magazine. Enjoy. 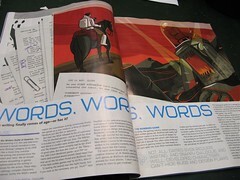 I was lucky enough to work with Games For Windows Magazine (fomerly Computer Gaming World) on more than a dozen double-page spreads with accompanying spot illustrations. Every issue was a different challenge to communicate something visually to an audience that's been oversaturated with visual stimulus for years. They were really open to different ideas and styles. Below are some of the projects that we worked on together. This was the first spread that I did for CGW. The article was about the swarm of online PC games freely available on the internet. The direction was to depict some sort of swarm. I had just returned from Portland, OR where I spent a lot of time at Ground Kontrol Retro Arcade. The place is loaded with fully retored game cabinets from the 80's and I was pumped to make some vintage arcade inspired art. The art director graciously tolerated my insistance for this style and we went with it. 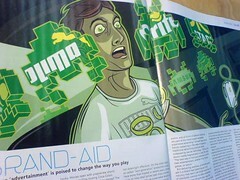 This illustration was about the onslaught of in-game advertising in PC games. I was still interested in exploring imagery from the roots of video games, so this piece features space invaders. It was important to the article that we include as much branding as possible in the spread. Unfortunately, the final,printed image was cropped and obscures the Funyuns bag. One of most interesting articles during my run with GFW was a feature on "The Hidden World of Christian PC Games". Apparently, Christian bookstores often carry exclusive video games specific to the Christian Faith. The function on the article was to be impartial and just unearth this subset of games to a wider audience. I decided to illustrate the idea by showing a scene in the Garden of Eden at night time. This spread was for an editorial about American games companies moving operations to China and nurturing those new jobs.The art direction called for some kind of chinese dragon and maybe an eagle. I chose to depict a mother eagle tending to her surrogate dragon chicks. This was a spread for an article about cheaters in massively-multiplayer games. Some people will go to great lengths to gain power in a game, even if it means taking advantages of flaws in the system, or preying on newbies. The original direction of the art was to use fantasy-based characters cheating on a test, but it evolved into something more universally familiar and was a lot more fun in the end because of it. 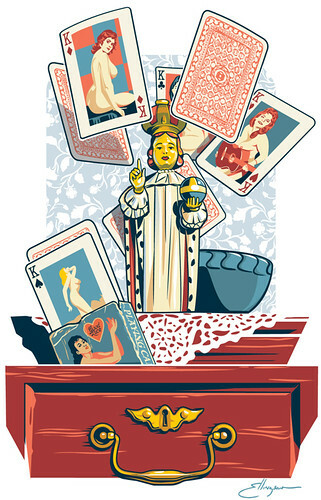 More of my artwork for Games for Windows Magazine can be seen by visiting my Artwork by Client collection on Flickr. Carrying Home 2, originally uploaded by joshuaellingson. Behind my Grandparents' house, there's a barn. When my mom was a kid, they had animals in the barn, but ever since I can remember, it's been an antiques workshop/storage/showroom. It always smells like sawdust and wood stain. Porkchop Express, originally uploaded by joshuaellingson. I made this for an upcoming art auction benefiting the Hell's Belles car club, here in San Francisco. I had this idea for last year's auction, but I dusted off the sketch and finished it up for this year. 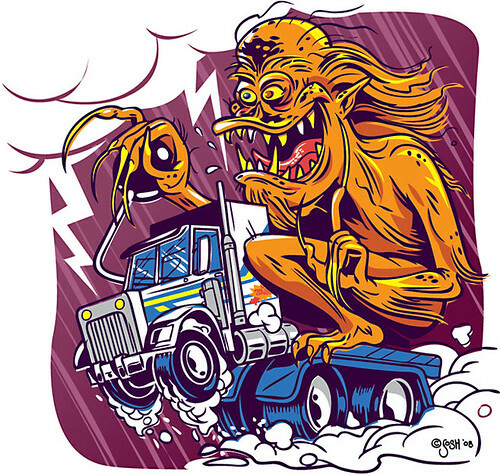 I've always been a huge fan of John Carpenter's, "Big Trouble in Little China" and I love the classic Big Daddy Roth hot-rod illustrations. It just seemed like a natural fit. Special thanks to COOP, for posting a gallery of Roth memorabilia. It was great for inspiration. Also, if you are a BTILT fan like I am, you'll want to head over to The Wing Kong Exchange website for lots of fun Big Trouble in Little China stuff.